In this assignment you will create software for a smartwatch. It often happens, in the new media arts, that a new device is released to the public. Thereafter follows an exciting time of exploration as artists and designers explore the new cultural, aesthetic and tactical frontiers made possible by the device. New media artists and designers must be prepared to innovate — quickly — with new technologies as they arise. Developing software for newly-released hardware can be challenging, however. There is often very little documentation, and few other people with directly relevant experience. This assignment mirrors these conditions. Create new “visual clock” software for the Pebble. You are not permitted to use conventional numerals (Roman/Arabic/Chinese etc.). Your project should somehow show the current time, either literally or abstractly. Try to devise a novel graphic concept, e.g. not just a circular clock face. Feel free to experiment with any of the graphical tools at your disposal. See Lee Byron’s CenterClock, made in my Processing class in 2006. Here’s a clock that I made way back in 1999, when I was in graduate school. 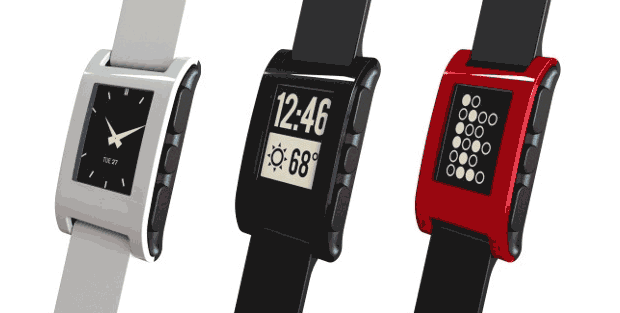 The Pebble watch is capable of doing much more than showing the time. In addition to various sensors (e.g. accelerometer), it also connected to the internet. Although a watch face is the expected (and wholly satisfactory) response to this prompt, feel free to use the Pebble as a general-purpose computing platform, for some other concept. Create Pebble software and load it onto the watch. Here is a technical startingpoint. In a blog post, please write a paragraph of 100-150 words about your goals, your process, and your own evaluation of your results. Document your project with an embedded YouTube video, and a selection of stills from various times of day. Include scans or photos of your sketches in the blog post. Categorize your project with the category, 13-pebbleclock.